Studies on retinoblastoma have led to several landmark studies in cancer genetics over the past 4 decades. In 1971, Knudson proposed that retinoblastoma might initiate by biallelic inactivation of a putative tumor suppressor gene (Knudson 1971). This “two-hit hypothesis” was based on the observation that there were two distinct forms of retinoblastoma seen in the clinic. Children with a family history of retinoblastoma often had bilateral multifocal retinoblastoma. In contrast, children with unilateral retinoblastoma rarely had any family history of the disease. Knudson proposed that for retinoblastoma to form, both copies of a putative tumor suppressor gene had to be inactivated. Children with a family history of retinoblastoma inherited a defective copy of this tumor suppressor gene and were likely to have retinal cells that sustained mutations in the second allele, leading to multifocal bilateral retinoblastoma. In contrast, children who have two intact copies of the retinoblastoma susceptibility gene develop retinoblastoma only when a single cell sustains two independent mutations that inactivate both copies of the gene. 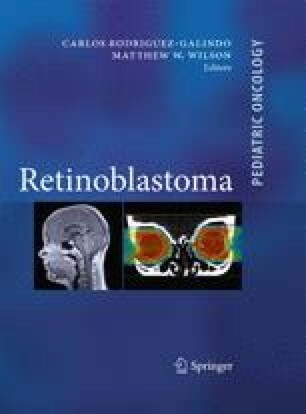 The lower probability of two inactivating mutations in the retinoblastoma susceptibility gene could account for the observation that these children often had unilateral retinoblastoma with fewer tumor foci. Several years later, Weinberg’s lab cloned Knudson’s putative tumor suppressor gene by studying genetic lesions and chromosomal aberrations in families with a history of retinoblastoma (Friend et al. 1986). This was the first human tumor suppressor gene to be cloned and it was named RB1 (Friend et al. 1986). Initially, researchers believed that RB1 was important for retinoblastoma susceptibility, but its role in other human cancers was unknown until Harbour and colleagues found that the RB1 gene was also mutated in lung cancer (Harbour et al. 1988). Today, it is widely held that most, if not all, tumors have sustained genetic lesions in their Rb pathway that contribute to deregulated cellular proliferation. These landmark studies on the genetics of retinoblastoma susceptibility have had a major impact on our understanding of tumor suppressor genes and have formed the framework for much of our current knowledge of genetic lesions associated with tumorigenesis.